Well So it is, after a long nearly 5 mo Rx Saturn has turned in Capricorn to resume forward motion. Have you felt stalled, low, depressed, anxious, stubborn, challenged, and uncomfortably pushed to move, change and grow? In fact this is something we all have collectively been feeling in our own unique ways and areas of our lives (based on your Capricorn house and natal Saturn placement). 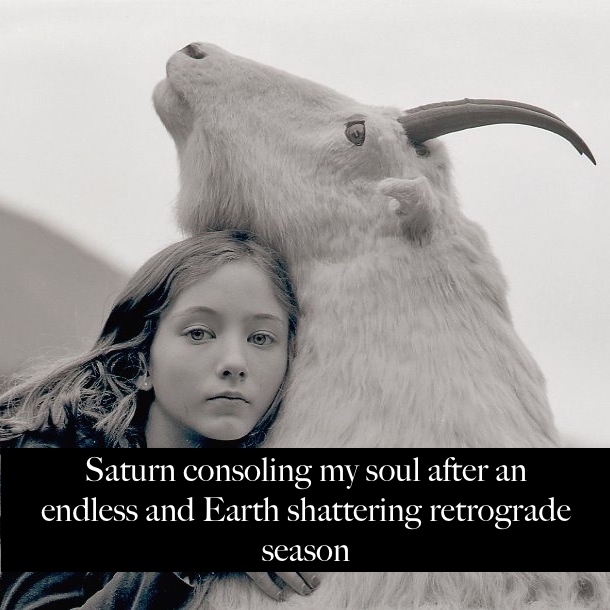 THE GOOD NEWS is Saturn Retrogrades are V intentional.👐🏼 He appears and feels to be completely breaking us down, stripping us of “accolades”, ego, jobs, relationships, habits and dysfunctional thought patterns. All of these areas come under inspection of Saturn’s fatherly watchful eye, and even more so since he is quite at home in the structured no BS sign of the diligent and nose to the ground Capricorn goat. Take some time over these next couple days to reflect back to March… What was coming up for you? This was when Saturn went Retrograde. The past 5 months intended to break you down to your core in order for you to actually have a foundation that was solid enough to be built upon. Now lets take a deep collective breathe let it out and lets get back to business as usual- just more elevated and ALIGNED this time and without all of the baggage, habits and destructive thought patterns!